As promised yesterday, here is the complete source for the moving map solution. 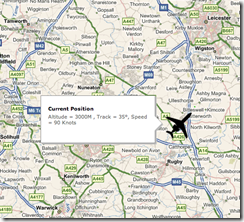 It is arranged as two visual studio solution (GPSd, GPSdMovingMap). The project files within the solutions are as follows. -- GPSd - Windows Service, that connects to and broadcasts a GPS. Configure the COM port of the GPS you wish to attach to in App.Config. In addition a fake file can be specified if you wish to test without real GPS hardware. The service writes to the application event log, if you wish to debug. -- GPSdClient - a simple client to consume a broadcast GPS, and test the above. -- MobileClient - a simple client running on Windows Mobile. 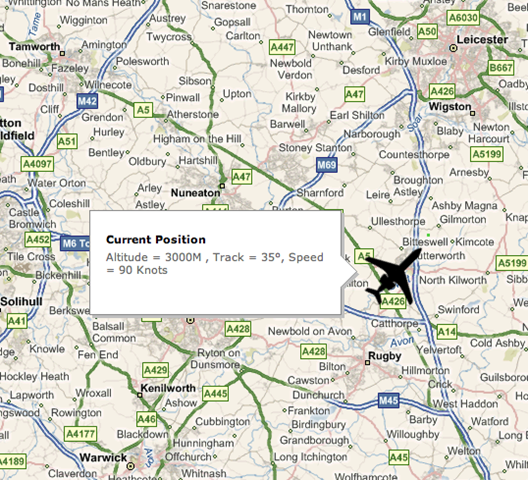 -- MovingMap - a web application for displaying the moving map. -- GetLocationService - a windows service for reading the GPSd and publishing the current position in a file referenced by moving map. Confiugration of the service is by app.config. Note to avoid swamping the MovingMap web application with data, app.config has a property called 'writeevery', which specifies how many NMEA sequences are read before the output is written. The service writes to the application event log, if you wish to debug. Anyway happy 2009. Put the word out, need to find a ferry, plane, river taxi to install this all.